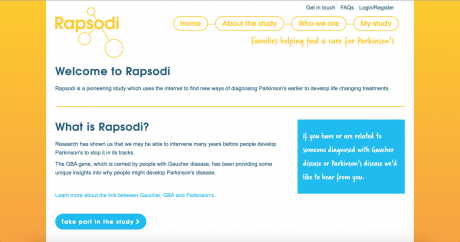 Have you enrolled yet onto the RAPSODI online study? Ambroxol clinical trial begins at the Royal Free and University College London. The research team at the Royal Free Hospital and University College London,led by Professors Anthony Schapira, Atul Mehta and Derralynn Hughes have over the last 6 years been investigating variation in the GBA gene and what it can tell us about Parkinson’s. People with Gaucher and some of their family members carry the GBA gene and there is a slighter higher chance of developing Parkinson’s in later life if you carry this genetic alteration, but this is still a very low risk and most people do not develop Parkinson’s. The research team is currently observing associated patterns of movement, memory, sleep, mood and sense of smell using an online study portal. The aim is to intervene much earlier before the movement symptoms associated with Parkinson’s ever develop and to protect the nerve cells in the brain. With the generosity of time and help of people with Gaucher their research has now led to a phase II drug trial of Ambroxol, a drug traditionally used as a respiratory medication which has been showing very promising neuroprotective qualities. Recruitment started last year in 2016 on the RAPSODI study. So far over 200 people with Gaucher disease and their families have done the online portal, mainly from the Lysosomal Storage Disorders Unit at the Royal Free in London. You can visit the study portal to see more about the research www.rapsodi.org.uk People are now being invited to take part from the other centres around the country and the team will be visiting Cambridge, Salford and Birmingham in the next few months. The study takes about 45 minutes to do on your computer or laptop at home and then some postal tests.